TUESDAY, January 17, 2012 (Health.com) — Celebrity chef Paula Deen, who appeared this morning on the Today show to confirm rumors that she has type 2 diabetes, likely faces an uphill battle in managing her disease, experts say. With time and effort, many people can control diabetes through diet and lifestyle changes alone, without the aid of drugs. But age and a lifetime of less-than-healthy eating may be working against the 64-year-old doyenne of Southern cooking, who announced that she is taking—and serving as a paid spokesperson for—an injectable diabetes drug known as Victoza. "It's a tough battle partly because it's 65 years in the making, and to change your habits at a later stage in life can be challenging," says Robert Graham, M.D., an internist at Lenox Hill Hospital, in New York City, who has not treated Deen. "But time and time again we have seen people very activated and motivated, especially when they…finally have a diagnosis like diabetes. Sometimes it's a wake-up call." Victoza has been linked to thyroid tumors in animal studies. At the urging of the Food and Drug Administration, doctors generally prescribe the drug only when lifestyle changes and at least one other diabetes medication have failed. That may be an indication that Deen, who hid her diagnosis from the public for three years, has had trouble controlling her condition. Is the Food Network Making Us Fat? Victoza "usually is a second [to] fourth option," says Ronald B. Goldberg M.D., an endocrinologist and diabetes researcher at the University of Miami's Miller School of Medicine. 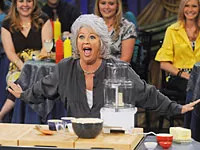 Deen, of course, is famous for the fat-laden, calorie-heavy dishes she serves up on the Food Network and in her best-selling cookbooks. Since being overweight is a major risk factor for type 2 diabetes, it's tempting to attribute her diagnosis to her sturdy physique and her taste for buttery, creamy dishes. In reality, however, the causes of diabetes tend to be more complicated. On the Today show, Deen emphasized to Al Roker that age, genes, stress, and other non-dietary factors can all contribute to the development of diabetes—and she has a point, says Keri Gans, a registered dietitian and the author of The Small Change Diet. "A lot of factors go into somebody getting type 2 diabetes," Gans says. "We can't just pinpoint one thing such as her cooking or…her weight." Family history is indeed a big factor, as Deen noted. People who have a parent or sibling with type 2 diabetes have about a 50% chance of developing diabetes themselves by the time they reach their 40s or 50s, says Jacob Warman, M.D., chief of endocrinology at the Brooklyn Hospital Center, in New York City. Eating an unhealthy diet doesn't ensure that a person will develop diabetes, but consuming too much of any kind of food can raise the likelihood of diabetes by contributing to weight gain. "The more fatty tissue you have, the more resistant your cells become to insulin," Graham says. "That's the…main force behind type 2 diabetes." Insulin, a hormone, helps usher sugar out of the bloodstream and store it as energy for future use. If sugar isn't efficiently removed from the bloodstream, it builds up and, over time, can damage kidneys, eyes, and nerves. Many people with diabetes therefore inject themselves with insulin to overcome their body's resistance and lower blood sugar. Victoza, the drug Deen is taking and promoting, does not provide insulin directly. Instead, it spurs the pancreas to produce insulin when blood sugar levels get too high. Victoza, along with Byetta, is one of two diabetes drugs that work in this way. Receiving a diabetes diagnosis—and learning that managing the illness will require lifestyle changes and possibly medication—is daunting news for most people to hear, says Geralyn Spollett, president of health care and education for the American Diabetes Association, a research and advocacy organization based in Alxenadria, Va.
"Every day we see success stories, [but] it's not easy," Spollett says. "During the first two years people are usually able to start to make some of the changes. When they realize it's a long-term process, it becomes a little bit harder to maintain those changes." Deen has teamed up with her sons, Bobby and Jamie, and the maker of Victoza, Novo Nordisk, to promote lighter versions of her signature recipes. Deen's own dietary changes have reportedly only gone so far, however. She has vowed to continue cooking with real butter and eating all her Southern favorites, though always in moderation. That attitude may not necessarily be a bad thing. "A lot of people have difficulty changing [their lifestyle] because they try to make it too drastic," Gans says. "I'm all about making small changes." Any revamping of Deen's recipes and Food Network shows will be for the better, Warman says. "You can't argue with people's taste buds," he says, "but certainly we discourage those kinds of shows."